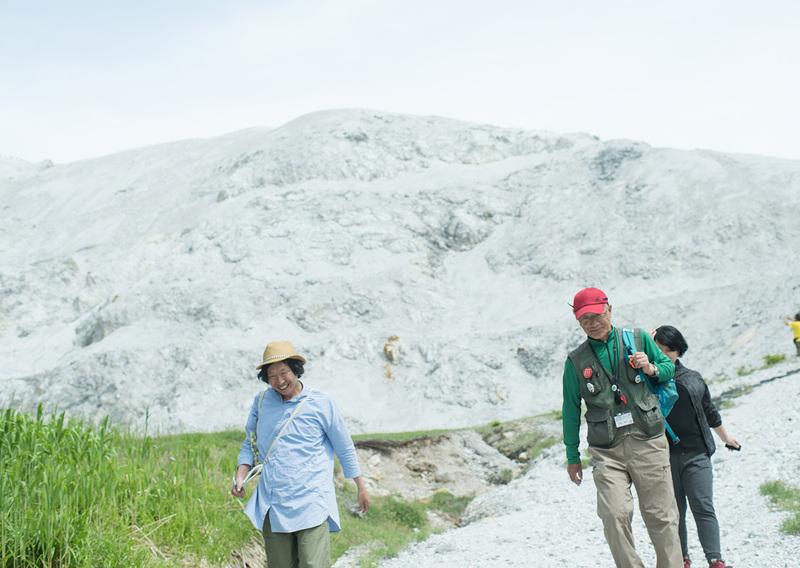 One of these geo-guides, Mr. Tetsuya Abe, is kind enough to take us round the park. 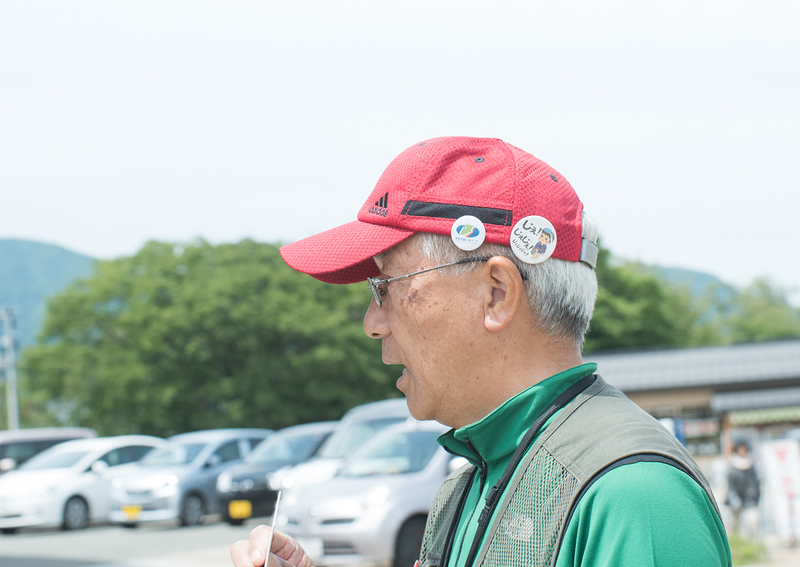 He was Head of the Geo-Guide Association up until last year. The number of geo-guides has increased steadily since the organization was launched, and there are now four guide groups who take it in turns to do the job here. Mr. Abe starts by giving us some slightly disappointing news. “The water temperature is still quite low, so the ‘onsen’ isn’t really warm enough for bathing in at the moment.” Since the bathing season typically runs from early July through to mid-September, it had crossed my mind that since we’re doing this feature in mid-June it might be too early to take a dip in the water. 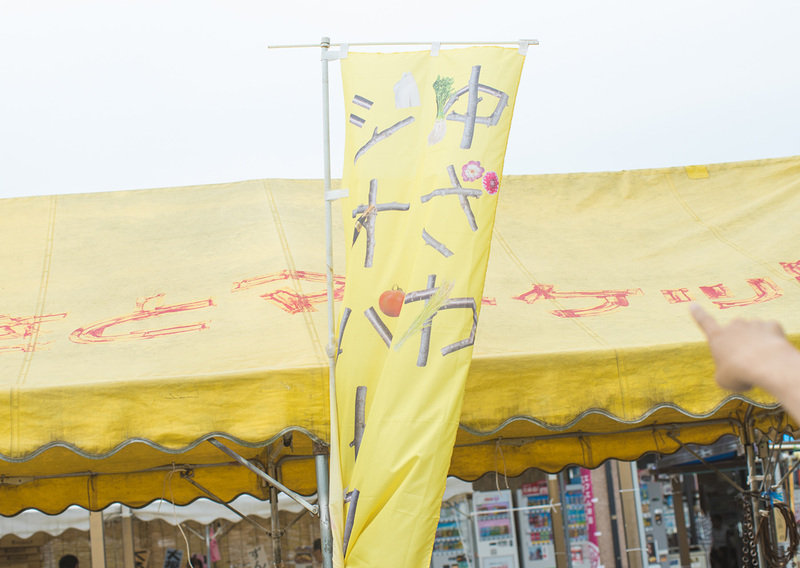 We leave the Yuzawa town area and head into the mountains, traveling on the Ushu Road along the River Omono. 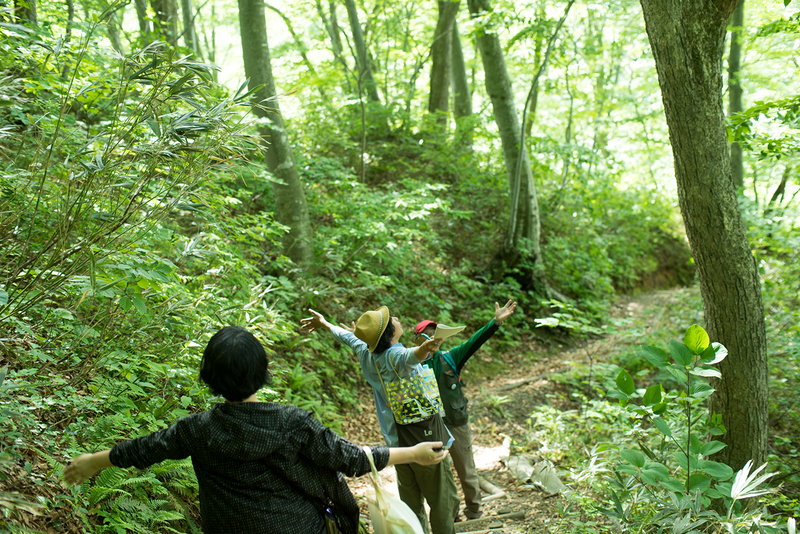 We cross the Sanzu River Valley at a height of 40 meters. 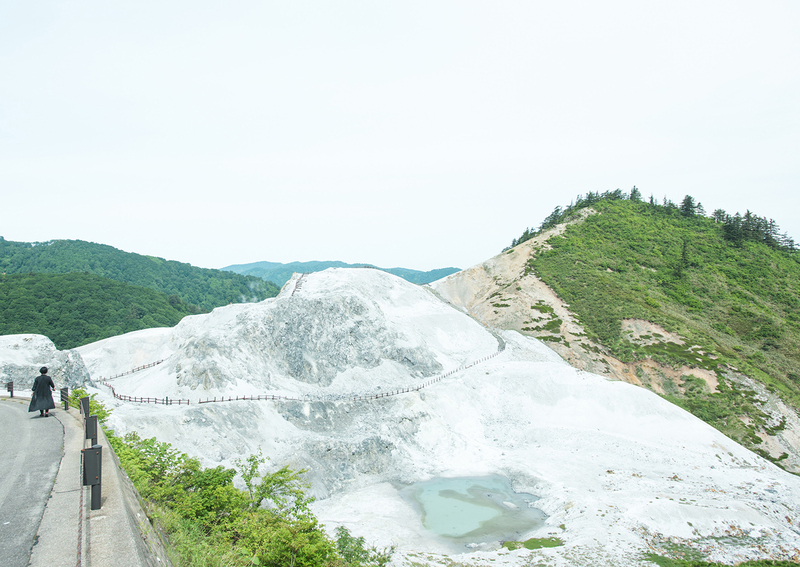 It is difficult for oncoming vehicles to pass each other on this single lane road, and the smell of sulfur gradually filters through into the car even though the windows are closed. It really feels like we’re getting close to “Hell”! 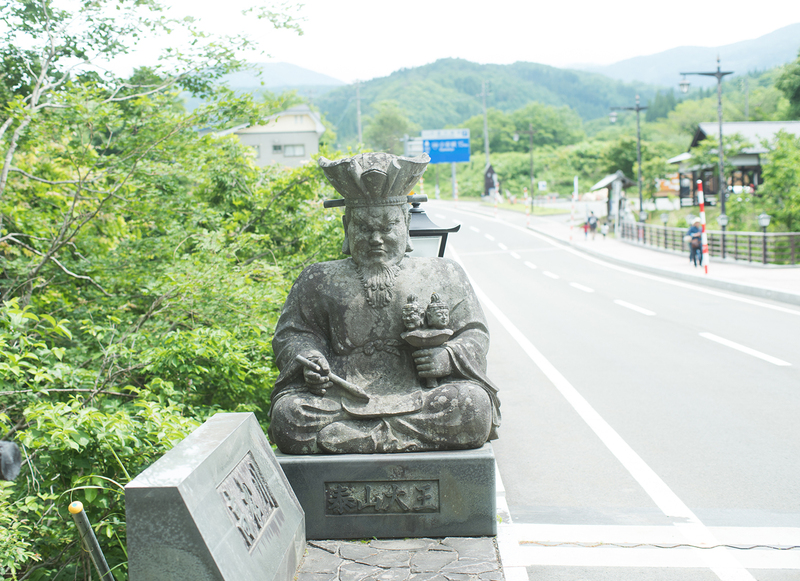 I see stone statues of the “Enma Daio” (Great Devil) and the “Taizan Daio” (King of the Mountain) at the foot of the Sanzu River Valley bridge. This lifts my spirits. In between the bright green of the forest, I catch glimpses of a desolate looking, pure white mountain. The surface of the ground at Kawarage Jigoku is all completely white like this, with no plants or vegetation able to survive the hydrogen sulphide fumes. 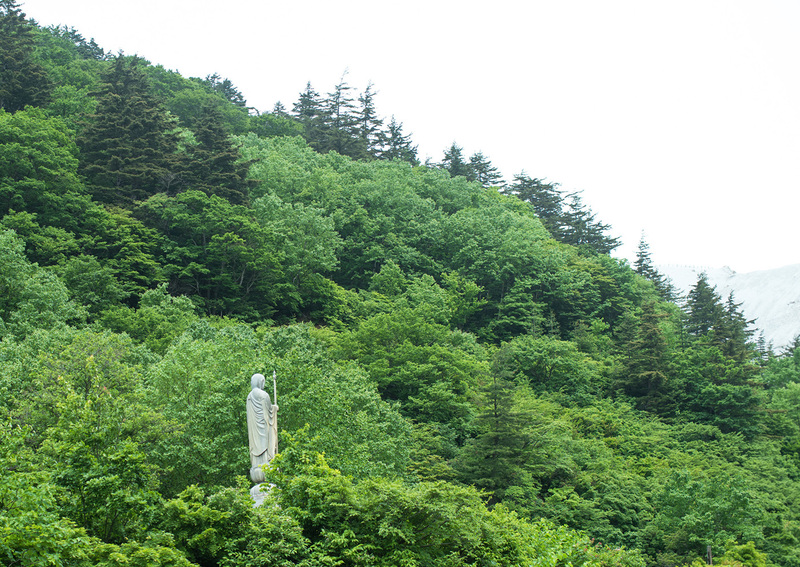 An enormous “Jizo Bosatsu” (guardian deity) stands guard, watching over the mountain. This is one of Japan’s “Three Holy Mountains”, along with Mt. Osorezan in Aomori and Mt. Tateyama in Toyama. The sulfur smell is stifling so it’s difficult to stop for too long. The hot spring wells up here in Kawarage Jigoku, and the water mixes with stream water from the mountain and cascades down. 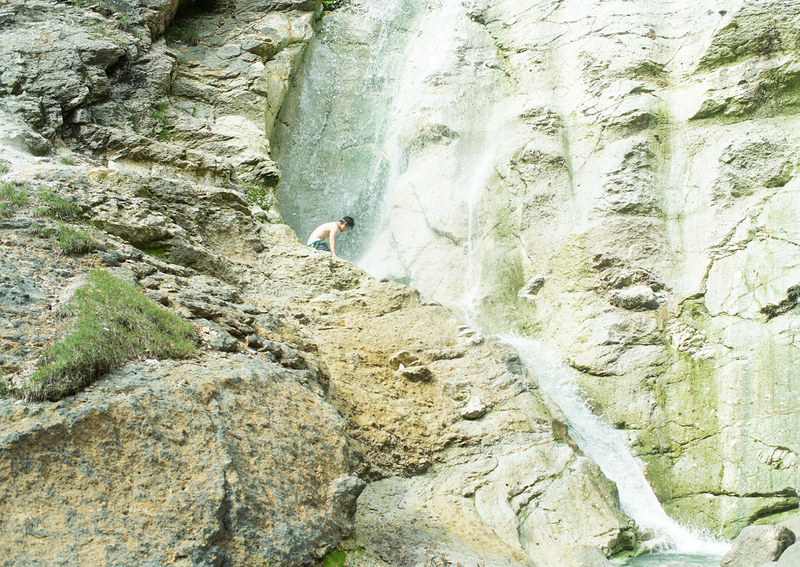 The hot spring waterfall, known as Kawarage Oyutaki Waterfall, has a drop of 20m, although you can’t see anything of the waterfall from Kawarage Jigoku itself. All you can see is the steam rising, with water building up little by little and then trickling down the mountain. “Watch out! The water is boiling hot!” I feel like reaching out and touching the water, but Mr. Abe shouts out his warning. Before the water flows downstream, it is still very hot. At the moment, it is around 98℃. Mr. Abe points out things of interest, such as striking-looking plants, as we walk along. The photo shows him giving us some tips about bathing in the forest. 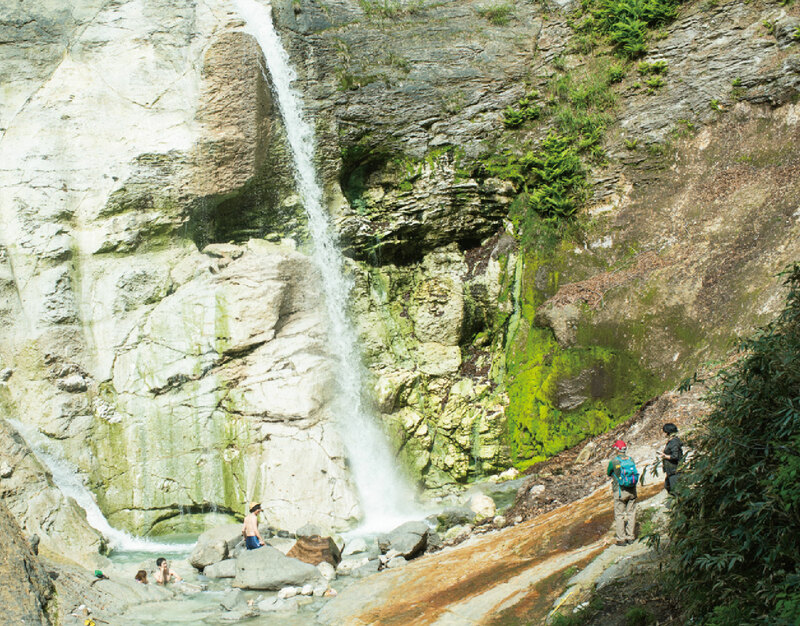 We walk down the mountain path for 15 minutes from Kawarage Jigoku, and gradually the Kawarage Oyutaki Waterfall comes into view. It really is a majestic spectacle. If I hadn’t known it, I would never have guessed that this was a hot spring. 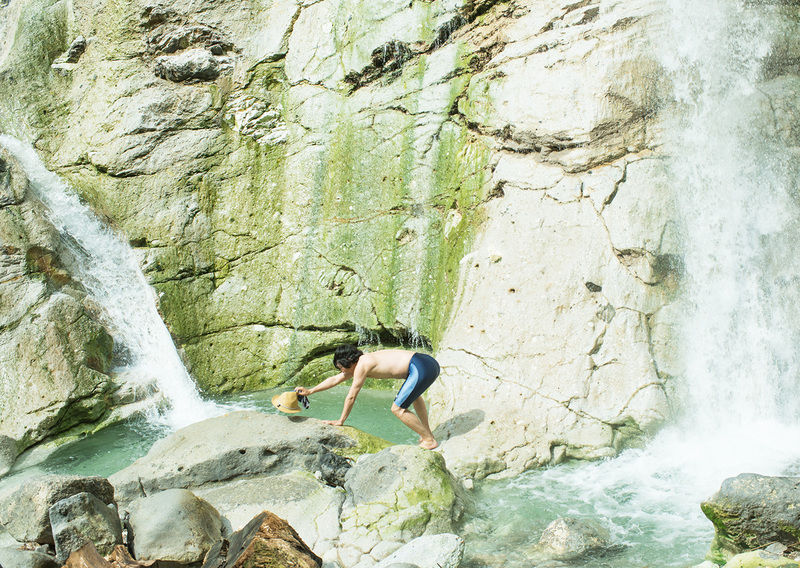 A group of couples are already bathing in the waterfall basin when we get there. Mr. Abe tells us that the water temperature at Kawarage Oyutaki Waterfall the previous day had been 31℃ and had been quite low for bathing. 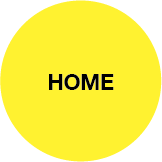 However, there is no set rule for the minimum temperature for bathing, or what time of year you can start bathing from. 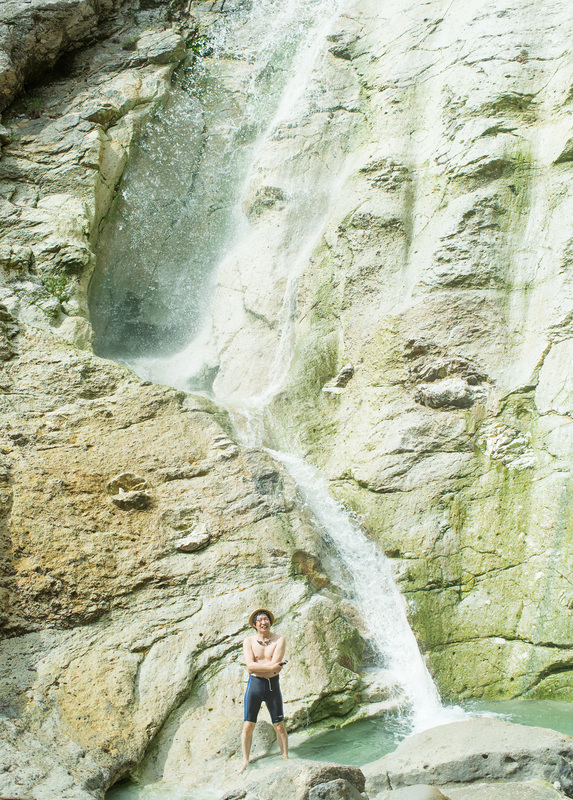 This is a totally natural waterfall in a national park, so it is completely up to you as to how you use it. There is a very basic changing room next to the river. It is recommended that you wear a swimsuit. I ease myself gently into the river. The water is fairly lukewarm. Then it starts to feel fresher. I have a sudden urge to plunge right into the water up to my head. This is more like being in a river than in an “onsen.” Nevertheless, it’s an amazing feeling that this is warm water rather than cold water. It gets right into your eyes and has a sour taste. It is strongly acidic. 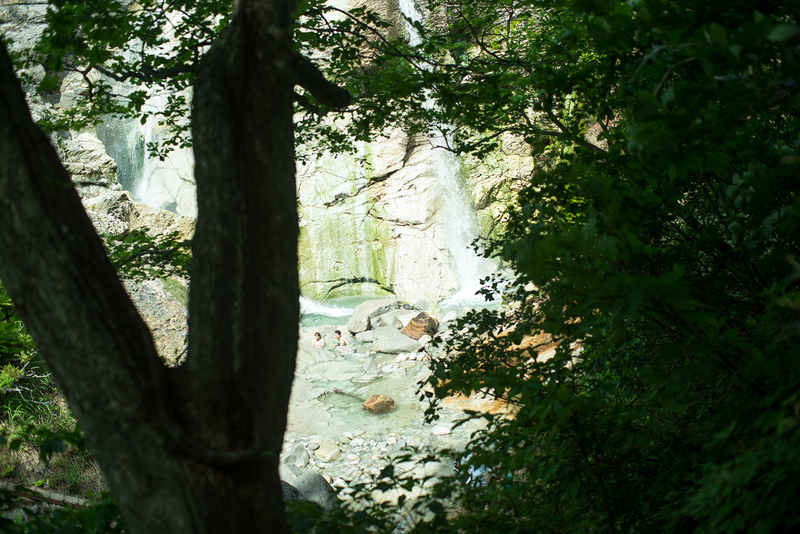 Kawarage Oyutaki Waterfall is divided into two. One waterfall cascades down gently to a half-way point on the left. The other waterfall on the right drops down directly from a height of 20m. Even the gentler waterfall on the left pelts you with water in a way that you’ll never have experienced in any ordinary bath house. I find the volume and the pressure of the water, and the force of the wind it creates, overwhelming. It will knock you over if you’re not ready for it. I’m amazed that there is such a clear temperature difference between the two waterfalls, but the water temperature is totally dependent on the extent to which the mountain streams dilute the hot spring water. 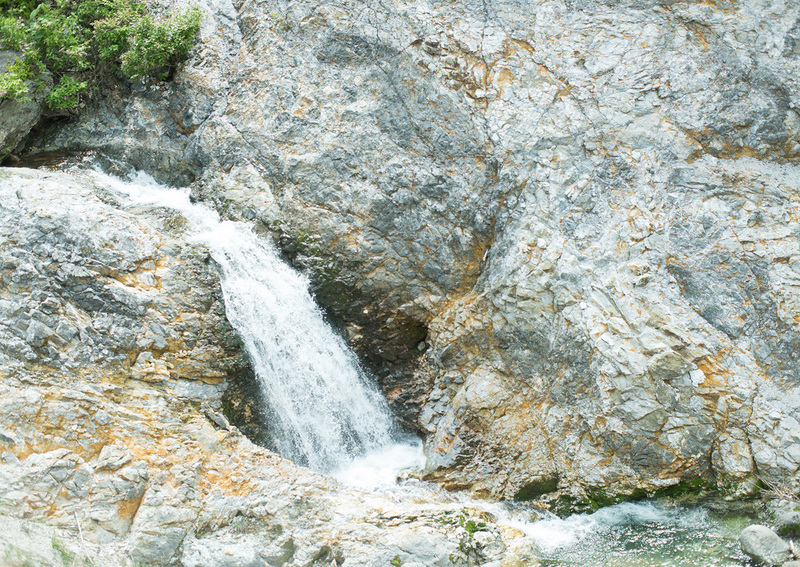 According to Mr. Abe, the snow has been slow to melt this year, so there is a lot of water in the mountain streams. That keeps the temperature low and prevents the waterfall water from warming up. In any case, if you think about it, the water temperature range in which we feel comfortable having a bath is actually very narrow: at a broad guess it is about 38 ℃ – 44 ℃. Rainwater penetrates the ground below and is heated by the magma. It then comes up out of the ground and mixes with the mountain streams, ending up at just the right temperature for humans. I’m sure you’d agree that’s nothing short of a miracle! 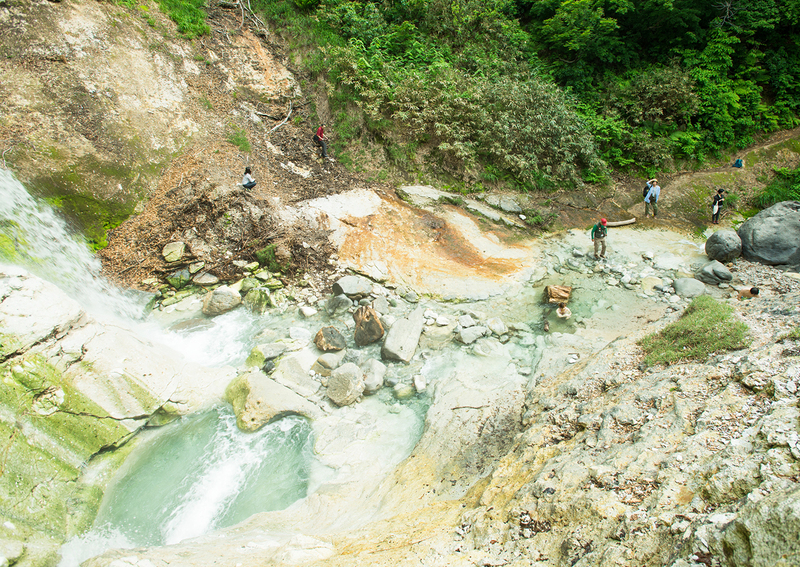 The basin of the waterfall has been formed into an ideal size and shape for humans to bathe in. So Kawarage Oyutaki Waterfall exists because of the fortuitous coincidence of a number of different natural miracles. 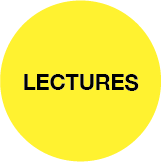 If we think about it in geological terms, the terrain as it is now has been formed by the long-term accumulation of volcanic ash, earth and sand. 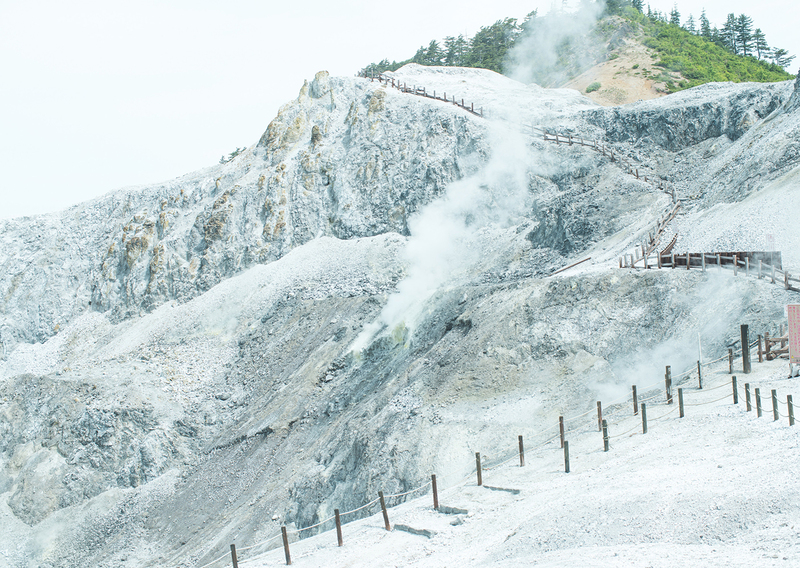 Large-scale volcanic activity 7,000,000 years ago formed a volcanic crater lake eight times larger than Lake Tazawa. Mt. 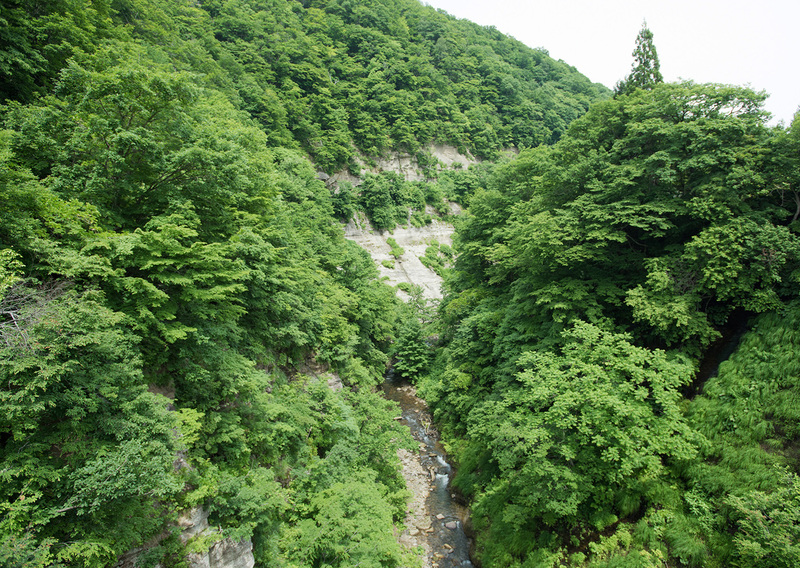 Takamatsu-dake erupted 260,000 years ago, and the abundance of magma left near the surface beneath the ground is what gives us Kawarage Jigoku and Oyutaki Waterfall today. From a geological perspective, the time span involved and the sheer scale of all this is breathtaking. Not surprisingly, rather than just leaving it be, the authorities have decided to harness Mt. Takamatsudake’s energy and put it to good use. The Uenotai geothermal power plant is the fifth largest power plant of its type in operation in Tohoku. The power plant at Wasabisawa is due to come into service in 2019, with construction already well underway. Now I fully understand what the earth’s energy and natural miracles are capable of: Oyutaki Waterfall is a completely natural hot spring which has had absolutely no human input. 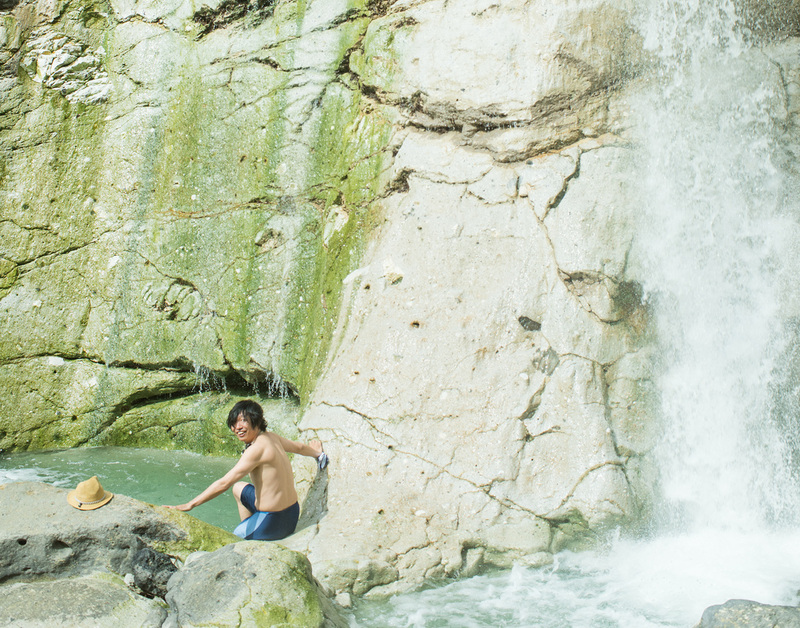 Even though Mr. Abe grew up in this area and came to Kawarage Jigoku on school trips, he tells us he has never actually been for a dip in Oyutaki Waterfall, not even once. This shows we each have our own way of relating to the earth and the land around us. The main thing is to acknowledge and accept nature for what it is. Next time I’m going to introduce you to some of the other extreme nature hot springs that we dropped in at on the way between coming here and our previous visit to Fukenoyu Onsen. 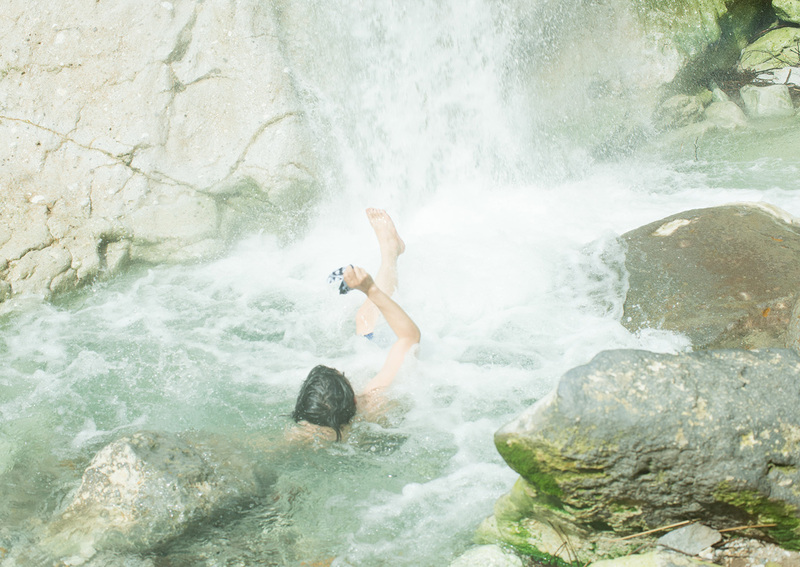 These are yet more amazing examples of extreme nature “onsen”!